File image of an Altamont Corridor Express train. A service cancellation on the Altamont Corridor Express commuter train line has been extended to include Wednesday, ACE officials said Monday. On Sunday morning, ACE officials first announced that there would be no train service between Stockton to San Jose Monday and Tuesday because of weather and flood-related outages. At about 12:40 p.m. Monday, ACE officials said on social media they had extended the cancellation through Wednesday as a result of the weather-related outages as well as other unforeseen service disruptions. Pacific Railroad, which operates the tracks, to reroute freight trains through the ACE route. The rerouting then prompted ACE to cancel service, Kay said. Although rain is expected throughout the Bay Area and Central Valley later this week, Kay said he hopes service will be back to normal by Thursday morning. "We're hoping it dries out enough to get everything moving again," Kay said. During the disruption, riders coming from the Central Valley can take the San Joaquin Regional Transit District's Route 150, which takes passengers from Stockton to the Dublin/Pleasanton BART station. For Bay Area riders, Capitol Corridor trains will honor validated ACE train tickets between Fremont and San Jose both in the morning and in the evening, according to Kay. The Altamont Corridor Express normally runs four westbound trains from Stockton in the morning and four eastbound trains from San Jose in the afternoon. 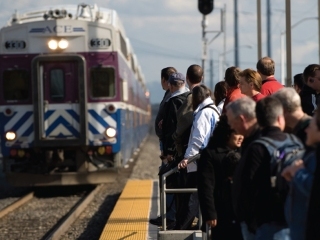 The line has 10 stations in Santa Clara, Alameda and San Joaquin counties.